Think Babel, Crash [not the first one], Short Cuts, etc. Perhaps because it is in some ways novelistic, I find this a compelling structure, making a first viewing pleasurable even if I end up not thinking too highly of the film itself a few hours or days after watching it -- both Babel and Crash caught me in their nets when I first saw them, though 12 hours later I realized I actually thought Babel was weaker than González Iñárritu's earlier work (which I'd liked, with reservations) and Crash was just weak. 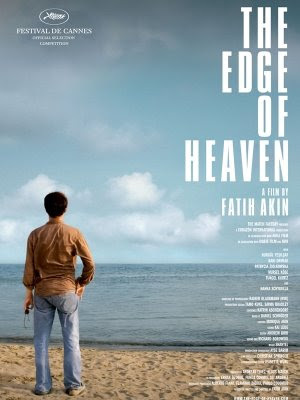 The network narrative of The Edge of Heaven offers a kind of 21st-century riff on Dickensian coincidences. But there's more than that -- the film is propelled by reversals and surprises that are caused by or correlated to missed connections rather than achieved ones. These missed connections lead, in the film's last section, to a new foundation of actual connections, but not of an expected sort -- the real achievement of writer-director Fatih Akim's script is that it doesn't hide how tenuous these new, positive connections are. Indeed, the film's final scene is entirely one of ambiguous potential, not actual connection. The first shots of the movie are chronologically part of this ending, suggesting the film is not so much about connections and coincidences as it is about the effort to live with them and to give them meaning. Like any of us, the characters are only aware of some of the connections between them; the film gives the audience an omniscient (or, at least, more informed) view than is available to us in life. Elise Nakhnikian wrote an insightful comparison of Babel and The Edge of Heaven that shows where some of the strengths in Edge of Heaven reside, and how the network narrative, in this case, is supported and deepened by the filming, the acting, the soundtrack choices, etc. I was especially captivated by the simple grace of the cinematography -- I didn't notice a single shot requiring a track dolly, a crane, or a vehicle mount, and yet the movie never feels static, because the camera is often among movement, whether looking through the windows of a train or the windshield of a car or capturing people as they wind their way through busy streets. The characters in The Edge of Heaven are, in many ways, types -- the young political radical, the disillusioned literature professor, the humane whore, the dirty old man, the college lesbian... Each character starts from that point, but none ends up there: they become particular humans, and their fates are often surprising -- the disillusioned literature professor does not end up in a doomed relationship with one of his students; indeed, he seems to have little need for a love life at all, because his interests and attentions are elsewhere. This sort of characterization mirrors the process of getting to know people -- we begin by fitting each other into broad categories, and then the categories fade as each individual comes into clearer focus. I fear I have made The Edge of Heaven sound more abstract and cerebral than it is. Let me say this, then: When I first watched it, I began by expecting to last for maybe fifteen minutes before shutting it off. I was tired, I just wanted some escapist fun, and The Edge of Heaven didn't look much like escapist fun. I was right about that: it is not escapist fun. But I was wrong that I would only last fifteen minutes. Within ten minutes, I was caught up in the film's composition and performances. Its fierce intelligence becomes gripping, the narrative's networks evoke suspense, and the effect is repeatedly emotionally searing. It is, simply, extraordinary. And so, the next day, I watched it again, and it was even better on a second viewing. *I hadn't seen the list of German entries to the Oscars before looking it up just now, and for my money, The Edge of Heaven, which did not get nominated, is superior to the previous three entries, one of which (The Lives of Others) won, and is roughly the equal of Nowhere in Africa (which also won).